South Bucks Mini Soccer Conference was pleased to be sponsored by Wycombe Wanderers FC seasons 2012/2013 and 2013/2014. Don Woodward Chairman of Wycombe Wanderers said, this was a great day for Wycombe Wanderers this sponsorship shows that Wycombe Wanderers would like to encourage far stronger ties with the local community. 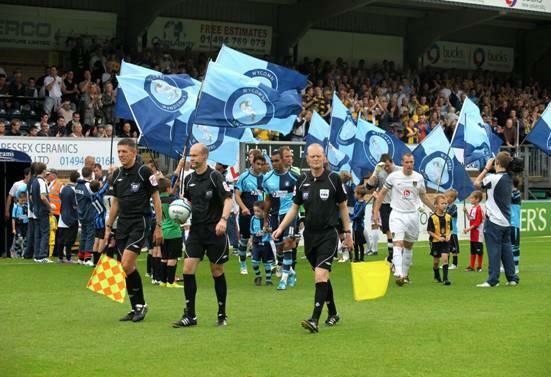 Wycombe Wanderers has sponsored the prize for the SBMSC Fairplay Award for many years. For information about what Wycombe Wanderers Sport & Education Trust can offer your junior Football Club visit the WWSET website. Site founded 1999 © 1999 to 2014 - the contents of this website are copyright South Bucks Mini Soccer Conference, BucksFootball.co.uk or respective owners where indicated.